I love muffins especially when they hit the mark of being nutritious and delicious at the same time. 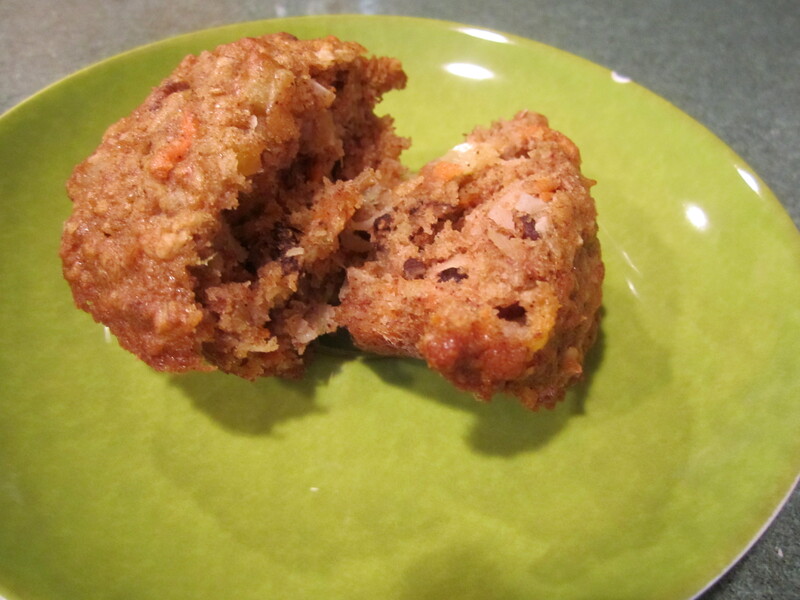 That’s how I feel about these muffins, plus they freeze well and make a great quick breakfast. When my sisters and I were kids, my mother would put wheat germ in ‘everything’ (she told us this later in life). I’m not sure what ‘everything’ was. I always assumed it was just baked goods, but I never asked her. As a youngster I was a terrible eater, so I am not surprised by my mother’s actions. If we went out for dinner and there was no tuna fish sandwich on the menu (wwhhaat!! ), then I would eat crackers and pickles (how that came about, I have no idea). 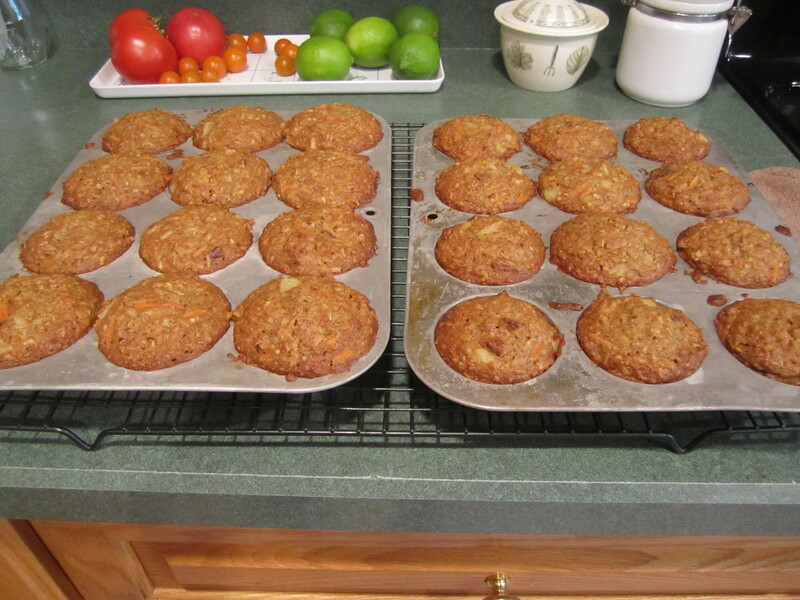 So including wheat germ and wheat or oat bran in this recipe just seemed the right thing to do. 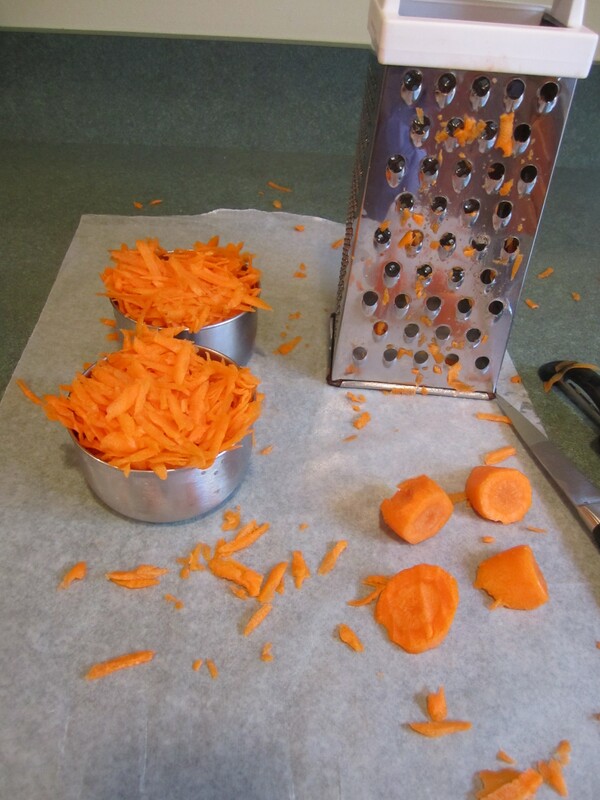 Possible additional alterations: substitute apples for the carrots or use a combination of apples and carrots. 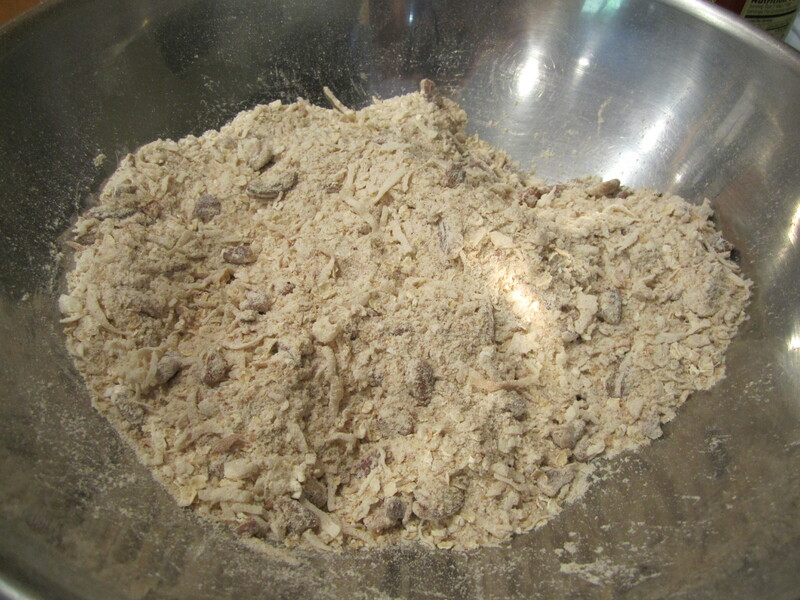 Substitute walnuts for the pecans or substitute raisins or use a combination of all. Spread with cream cheese frosting? mmmm, just thinking out loud! Pre-heat oven to 350 degrees. 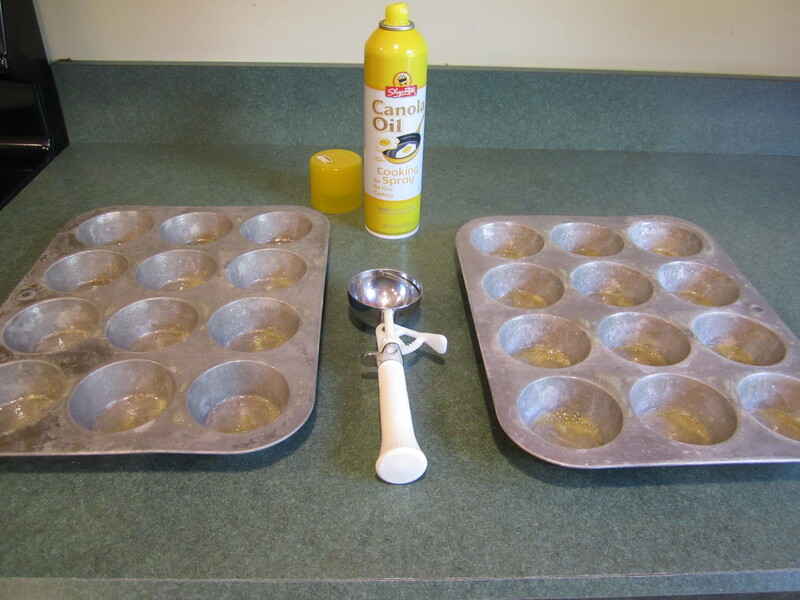 Spray 2, 12 cup muffin/cupcake pans with canola spray. 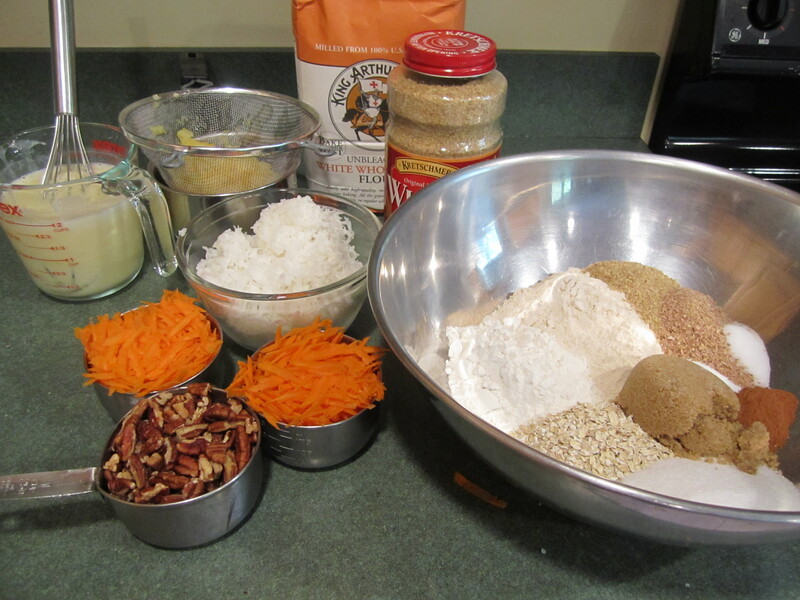 Combine and stir thoroughly the first 12 ingredients into a very large bowl, from quick cooking oats to coconut. Use your fingers to break up brown sugar and separate coconut. Combine liquid ingredients in a medium bowl or glass measuring cup: vegetable oil, buttermilk, eggs and vanilla and stir thoroughly with a whisk. 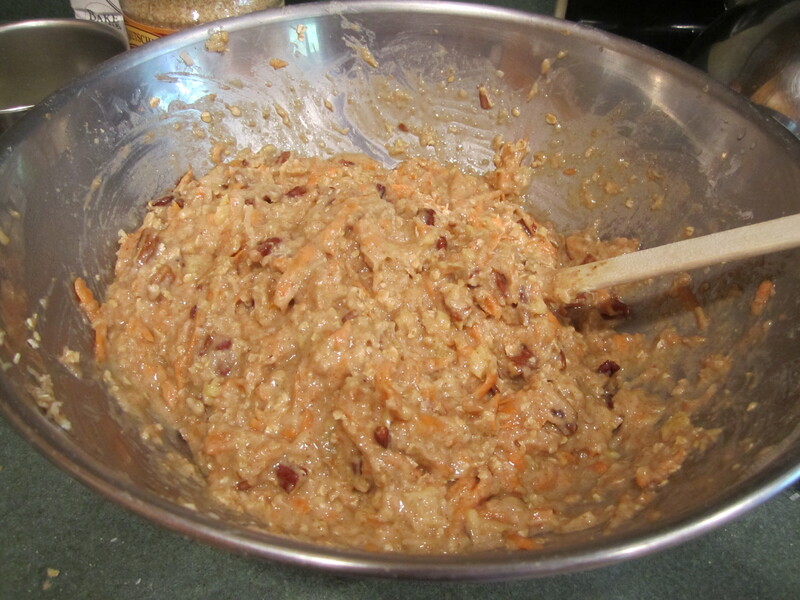 Pour liquid ingredients and carrots and pineapple into bowl with dry ingredients and stir until almost combined. Add boiling water and finish stirring. Be careful not to over mix. Using an ice cream scoop, scoop batter into muffin pans. 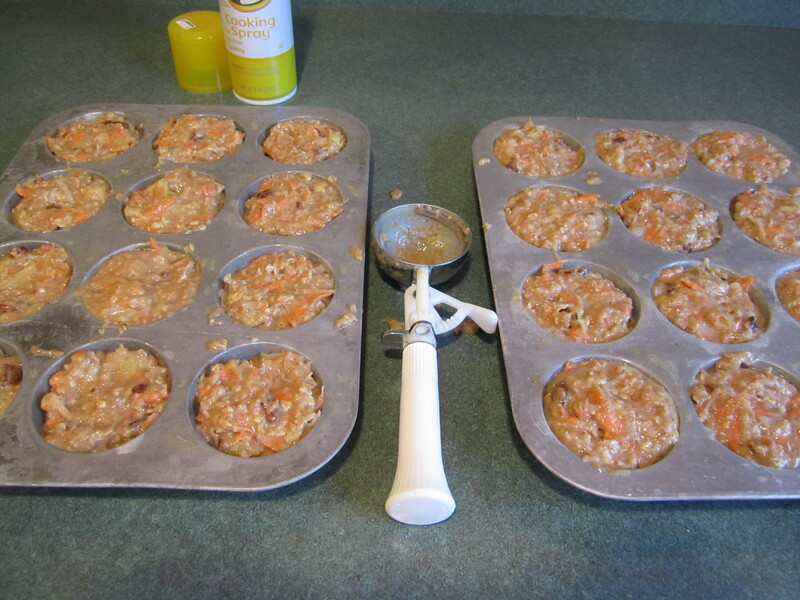 Cool in pans for 30 minutes and then remove muffins onto rack to cool completely. love these muffins! so glad to finally have the recipe 🙂 yum! Thank you! I agree about the yum factor!